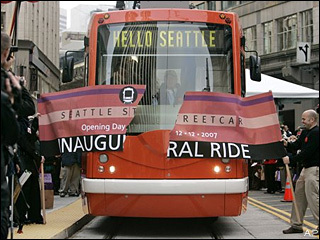 America's newest electric light rail transit (LRT) line – Seattle's modern, 1.3-mile (2.1-km) South Lake Union Streetcar starter line – opened for service on 12 December 2007, in a celebration filled with official speechmaking and crowds eagerly boarding the colorful cars for a free inaugural ride. Throughout the day, hundreds of riders were ferried back and forth between Westlake Center and the lakeside. 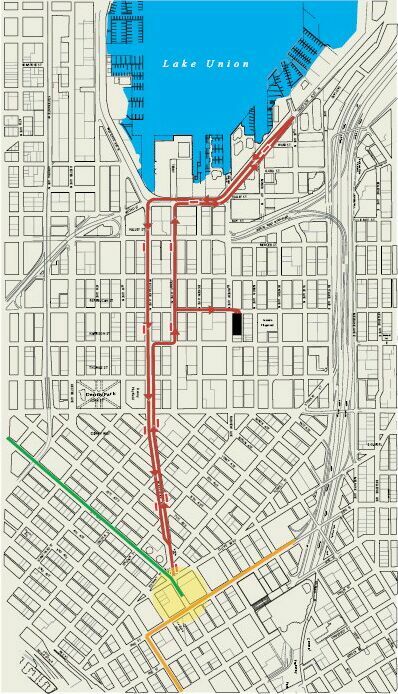 The line represents the return of streetcars to the heart of the central city after more than 65 years. 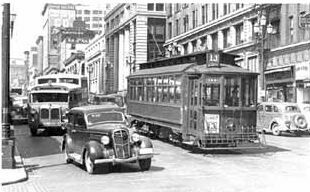 Seattle's last streetcar line was abandoned in 1941, during America's Transit Holocaust, and its infrastructure and rolling stock were subsequently destroyed. At the opening ceremony, according to KING-TV News (12 December), "Public officials were ecstatic, praising a project that took only 15 months to build." With dignitaries and a crowd of hundreds on hand, a streetcar breaks through a ceremonial banner to open the route for service. Indeed, the blazingly fast speed at which the streetcar line was installed is widely regarded as a major advantage of this rail transit mode. Construction began in July 2006, and was completed by mid-autumn 2007; operational testing with rolling stock took place over the intervening couple of months. The final investment cost of the project is reported as $52.1 million, representing a $1.6 million increase over original projections. That calculates to a unit cost of almost exactly $40 million per mile, for an alignment almost entirely in relatively expensive street environments. The streetcar line has 11 stops. Operating at average headways of 15 minutes, the system's annual operating and maintenance cost is projected to be $1.7 million a year. King County Metro will operate the system. For the crowds taking advantage of the free opening-day travel aboard the streetcars, the ride from the lake to Westlake Center took about 20 minutes, reported the Seattle Post- Intelligencer (Dec. 13th). According to the reporter, "The cars were quieter than a diesel-powered Metro bus, and the loudest noises were human conversation and the whir of the heating system." Another major environmental benefit of streetcar mobility was also praised, as Mayor Greg Nickels and other officials predicted the electrically powered streetcar line would help reduce greenhouse gas emissions. Crowds swarm to board Seattle streetcar on opening day. 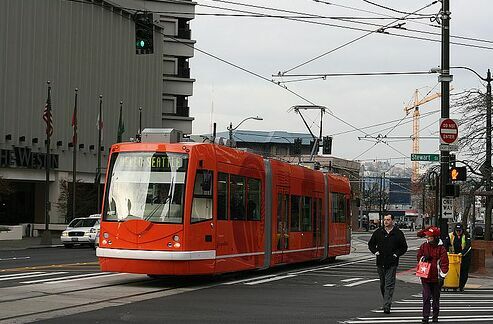 One of the primary objectives of Seattle decisionkakers and planners in re-introducing streetcar operation to Seattle has been to address the mobility needs of the fast-growing South Lake Union section of the city. As our article Seattle: USA's latest new-start streetcar project under way (16 November 2006) reported, "the trolley will link the Westlake Center to the rapidly developing South Lake Union redevelopment area, a fast-growing district projected to gain approximately 20,000 jobs by 2020, predominantly in the biotech field." But there are multiple benefits expected from the streetcar projected, including a huge boost for existing businesses. 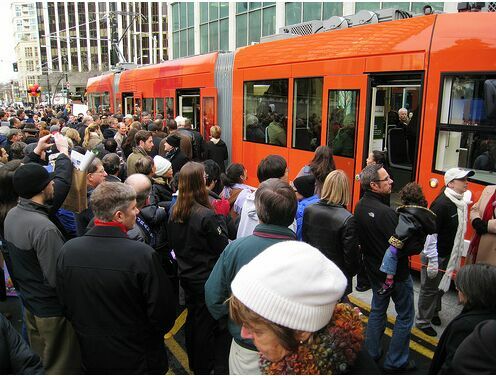 As a KOMO-TV News report (12 Dec. 2007) noted, "About 350,000 people are expected to ride the streetcar that passes right by businesses like the Denny Deli. For manager Gene Um, that's a lot of chances for his business to be seen by people that may have never passed by." "We're expecting it to help, just more foot traffic" Um told the TV reporter. "The more people down here the better." The economic impact is also highlighted in a report by the Seattle Post-Intelligencer (11 December 2007), which headlined: "Seattle Streetcar expected to boost retail business". Linda Robson, a spokeswoman for Sound Transit, pointed to the economic impact of the Tacoma Link streetcar – operated by Sound Transit – which apparently has been the stimulus for an increase in retail shops since the 1.6-mile line opened in August 2003. 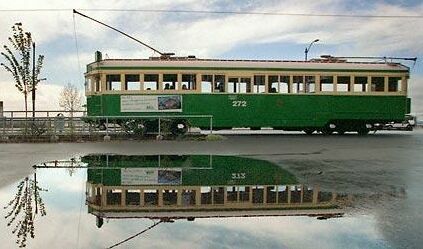 Some of the Tacoma streetcar's impacts were described in our own articles on the system. See, for example, Tacoma Link: The Little Tram That Could. Along the Seattle streetcar route, a number of business owners interviewed by the Post- Intelligencer expressed their optimism about the system's potential economic benefits. Dave Figueroa, owner of Scraps Dog Bakery at 2200 Westlake, predicted the streetcar line definitely would help his pet boutique business, located near one of the streetcar stations. "It will be normal for people to jump on the streetcar and ride downtown and vice versa" Figueroa said. "It's almost scary to think how many people will be coming through here." Figueroa said the streetcar's uniqueness also could draw customers downtown, and he has joined at least 33 other retailers in the "I Rode the Streetcar" program. This transit-oriented marketing promotion "allows customers who ride the streetcar from Wednesday to Sunday to get a sticker and take advantage of discounts and freebies at the participating businesses" reports the paper. The streetcar line is also expected to bring substantial traffic to most retailers around Lake Union. "We are very excited about it" enthused Christian Warren, manager of Outback Steakhouse at 701 Westlake Ave. N. "You can't go wrong with something like this, as far as I'm concerned." Indeed, if the South Lake Union starter line suceeds to the extent that its promoters anticipate, it could be the start of something much bigger in terms of returning streetcars to the urban fabric of Seattle. As we've reported (Seattle: South Lake Union Streetcar nears Dec. 12th startup), two University of Washington professors, in a study performed at the request of the Urban League and the Seattle Streetcar Alliance, have identified five other Seattle neighborhoods that appear to have very promising ideal conditions to justify additional streetcar lines. South Lake Union streetcar running along its route on opening day.